Improving your short game is the quickest way to lower your scores. While it might be more fun to smash long drives and hit pure irons from the fairway, the best golfers know that the most strokes are saved around the greens. Mastering chipping and putting on the practice greens can save valuable strokes on the course and lead to better results on the scorecard. Chipping and putting are performed around the green, with a slow, controlled movement designed to get the ball rolling quickly. Being a successful chipper and putter requires deft touch, which can be improved with practice and drills on the putting green. The swings for chipping and putting are fairly similar. Each swing follows a pendulum motion with the arms, wrists and hands moving in concert. When you swing the club back on both a chip and a putt, the distance of the take-back and the follow-through should be the same. Neither a chip nor a putt requires a big swing. Once the ball is struck, you should briefly hold the follow-through. When the golf ball comes to rest on the fringe around the greens, you can choose to either chip or putt. You should consider the conditions around the shot when choosing to chip or putt. If there is a significant amount of fringe between the green and the ball, you should choose to chip the ball. If the ball is resting close to the green, and the shot isn’t too long, it may work better to putt the ball. Also, the conditions of the ground between the ball and the green could influence your decision. To help develop touch with chipping and putting, try this drill on the putting green. Either imagine or create a 3-foot circle around a hole with golf tees. 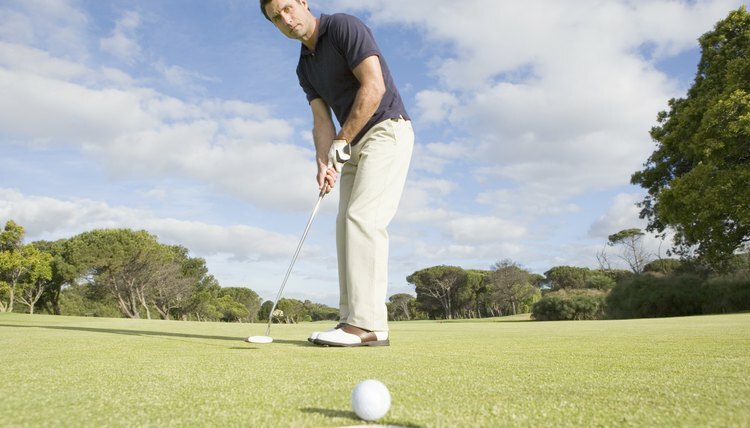 Then practice hitting long putts or chips toward the hole with the goal of getting the ball to stop within the circle. Getting the ball consistently close to the hole on chips and putts will lessen the chance of three-putts and increase the frequency of pars. Putting is done with the putter, while a variety of clubs can be used to chip the ball. If you want the ball to get rolling quickly, you can chip the ball with a 7 or 8 iron and play a bump and run shot. If you want a little more arc, a club like a pitching, sand or gap wedge can be used from the rough or fringe to chip. Can I Use a Putter on the Fairway?